We don’t like bags that weigh us down. We already shove too much stuff in them, thankyouverymuch. And now you can score this hardware free (!!!) 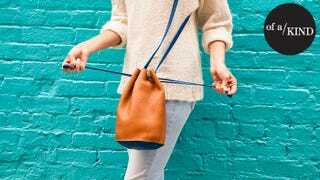 color-blocked number by Baggu for $10 off with the code BLOCKPARTY. Made in NYC, this guy’s all leather and has a pared-down, minimalist thing going on. Don’t let the two-tone motif throw you: The blue is practically denim-hued, and if jeans aren’t neutral, we don’t know what is. And get this: Emily Sugihara and Ellen van der Laan of the stellar line Baggu have been friends for decades. Like photos exist of the two of them playing with American Girl dolls together. Which just makes us really happy. Here is your chance to get one of the 100 bucket bags in existence! Scoop yours up for $130 with the code BLOCKPARTY now. Check out the other (limited-edition) coolness happening at Of a Kind, too: You can use that same BLOCKPARTY coupon code for $10 off anything you buy on the site through 11/1.